Remember last summer when Aaron, my dad, and I volunteered to drive to the remote parts of New Mexico to run several miles through the desert, sometimes in temperatures hot enough to melt the asphalt under our feet? And if that wasn’t absurd enough, that I also volunteered to pick up a complete stranger named Ty from Maine at the airport so he could run with us? Just in case you don’t follow my life as closely as I do, last June a nice man from England emailed me because he and a couple of his British runner friends were organizing a relay across America in order to raise money for the OneFund, the foundation that supports those most affected by the Boston Marathon bombings. We enthusiastically participated and made some friends along the way! (You can read the recap HERE). Well, they are doing it again. One Run for Boston Round II is kicking (running) off this March in Santa Monica, California, traveling (running) across the country, and concluding in grand style at Harvard Stadium in Boston about a week before the 2014 Marathon. Bart Yasso, the social media running maven from Runner’s World, has committed to running a stage along with almost 600 other people (Aaron, my dad, and myself included). The relay runs though California, Arizona, New Mexico, Texas, Oklahoma, Missouri, Illinois, Indiana, Ohio, Pennsylvania, New Jersey, New York, Connecticut, and Massachusetts. The cost to sign up for a stage is $50 (they are also asking for a $250 fundraising minimum but you will not be charged if you don’t meet the fundraising goal and as far as I can tell nothing bad happens to you). Most of the stages seem to be in the 5-17 mile range (I know a lot of people split up the longer stages). There are also group stages organized in major cities along the way (cost is $25 for group stages). You can get more information HERE. All participants get a free t-shirt and access to a very supportive and encouraging online community along with the excitement of running in slightly oddball locations during slightly oddball hours while raising money for a cause that I know has touched many people in the running community. Aaron, my dad, and I are all signed up for stages in New Mexico (they changed the route this year, so our stages are in a much more accessible place which makes me very happy). I get to run through a place called Pie Town! I LOVE pie! I’m also hoping not to have to pee roadside this time…March is also typically much less scorching hot than June. I would love to have you join our ORFB family! And, it goes without saying, that if you want to fly to Albuquerque to help us cover New Mexico, I will gladly pick you up from the airport (at least, probably…for all I know, I have a bunch of secret internet stalkers who are ax murderers…I would probably not agree to pick up someone who is an ax murderer)! You can also donate toward my fundraising goal HERE (this is actually the first thing I’ve done in the way of fundraising for this adventure). I KNOW you want to be this cool too! Let me know if you sign up (or if you just want to come and feed us snacks and give us water). Hope everyone had a wonderful first full week of 2014! Yesterday I did my 2nd 800’s series of marathon training. In half marathon land, we did 400’s and maybe 1 800 thrown in per workout. I liked 400’s. They made me feel fast! 800’s make me feel sick. And while I know I’ll build up my endurance, I was DONE after 3 (I still finished out my last required two, but they were noticeably slower than the first three). My fastest split was about 15 seconds faster than my fastest split a few weeks ago, so at least that’s progress! But man oh man do those 800’s not feel so good. I was dreading them all day. Plus, that promised rain storm never came so I was once again running in the 6:30 p.m. heat. Also, some jerk had the audacity to GRILL FOOD in one of the houses next to the track, so I got a major gag reflex every time I ran by that house. Yesterday I also got a phone call from an old co-worker of mine. She’s training for the RnR Denver Half, and she knew that we’ve been training for a marathon. 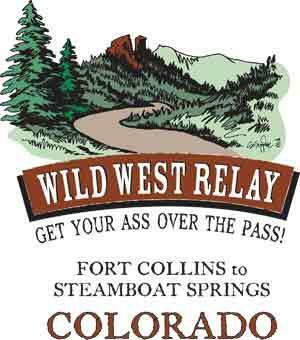 I guess a few people had dropped out of their 12 person relay team for the Wild West Relay Race that runs between Fort Collins and Steamboat Springs, Co, and she wanted to know if we were interested in taking their places. I have been wanting to do a relay just because everyone (like Erika) seems to really enjoy themselves at these relays! But it is easier to say that you WANT to do something than to actually do it. 1) I am terrified of the dark. I can’t help it. Running by myself in the dark sounds kind of nightmarish. 2) Wild creatures like bears, bobcats, mountain lions, SNAKES, bugs live in the forest. I don’t want to meet my demise because my headlamp didn’t illuminate the giant bear until it was too late. 3) I watch a lot of crime shows. Criminal Minds has let me know that running in the dark in the forest surly means I will be abducted by some serial killer who will lock me up in a cave. This doesn’t sound like much fun. Caves are dark. See #1. 4) Spending lots of time in a van with people who I might want to punch in the face. I only know 1 girl going in. What if I have the worst weekend ever because I have to spend it with truly terrible people? OR, what if they all want to punch me in the face? That’s pretty awkward too. 5) Getting lost. They only have signs at points where the course changes direction. The website literally says that they can’t be held responsible for signs that get turned the wrong way by some funny person, or if signs blow away. If you miss a sign, or if it isn’t there, or if it is pointing the wrong direction, then you are lost in the forest. See #’s 1-3. 6) Getting run over. The roads aren’t closed. We aren’t sure yet whether we’re going to do this or not. It will disrupt our training schedule a bit (MUST FOLLOW THE PLAN), and at $135 a person plus travel and accommodations, it starts adding up. With friends getting married here soon (and all the shower/bachelor(ette) parties going on with that), plus Chicago and all of those fancy stores and restaurants that the city must certainly contain, the next few months are going to be expensive enough already. Plus, Fort Collins isn’t exactly anywhere near Albuquerque, so we’d have to take days off work (I’m running out of those), and spend a weekend driving for hours, sitting in a van for hours, running for a few hours, and then driving for more hours back home. I could be doing a lot with those hours back home. So, we’re trying to make up our mind by this afternoon. I think it would be fun, but I also think it would be more fun if it was something that fit into our plan a little bit more. We’ll see what happens.